Security. We’re inundated (and blindsided) with media horror stories on a daily basis about lapses and compromises in cloud security. In our jobs, in online banking, our personal email…we just can’t get away from or ignore it. 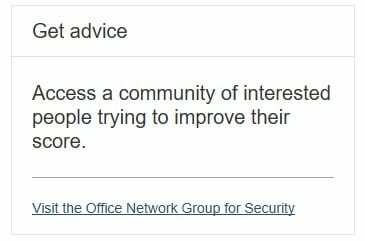 But what really makes something secure? Is our corporate and personal data ever really 100% secure? To be honest, we just want to use our stuff. We don’t want to have to worry about or learn new, sometimes complicated, features for a possible threat that may not even happen to us directly. And how do we make our environment secure in a way that we can comprehend and manage, that won’t be intrusive or inhibiting to our process flows? Unfortunately, as our identities and intellectual virtual property become more and more integrated with public domain, so does the increased chance(s) of those being stolen and used with nefarious intent. 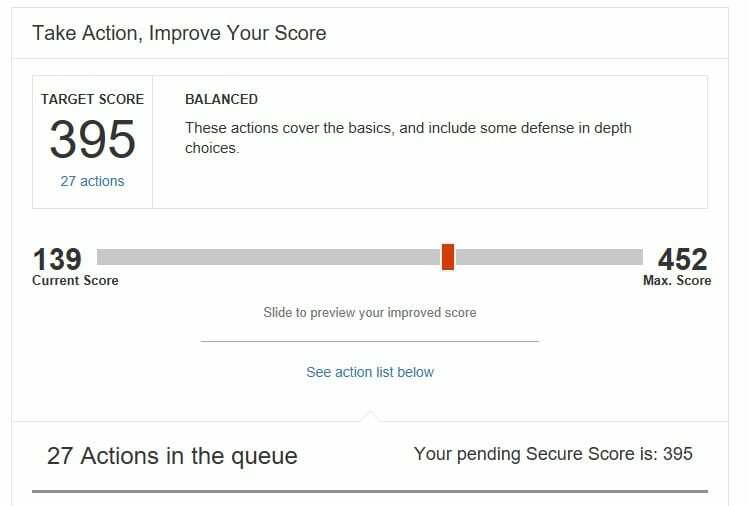 Fortunately, Microsoft has come out a new tool called Secure Score that can help lessen the burden of having to figure out the ‘under the hood’ mechanics of making something secure, while still providing us with that warm and fuzzy feeling from knowing we’re doing what we can to make it harder to be preyed upon and victimized. 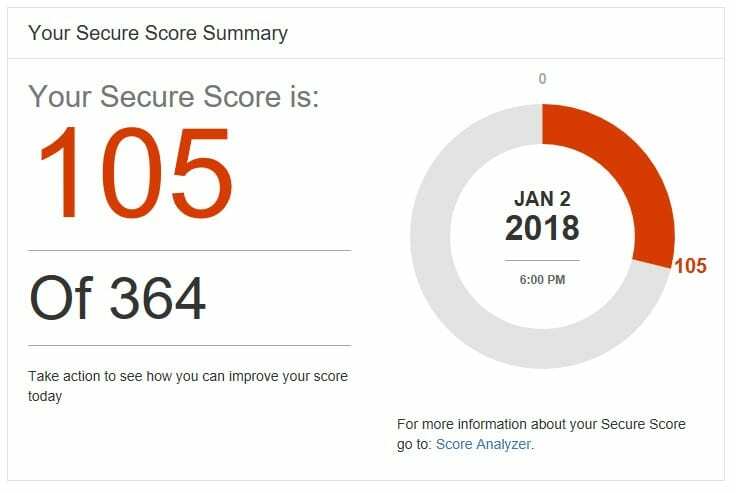 Secure Score is part of your subscription to Office 365. Account Breach – an account in your tenant is breached such that it can be used by an attacker to interact either with resources in Office 365, or with your on-premises infrastructure. Elevation of Privilege – an attacker has managed to compromise one or more accounts in your tenant, and is now working to increase their power. Data Exfiltration – an attacker has found a way to move data out of your tenant. 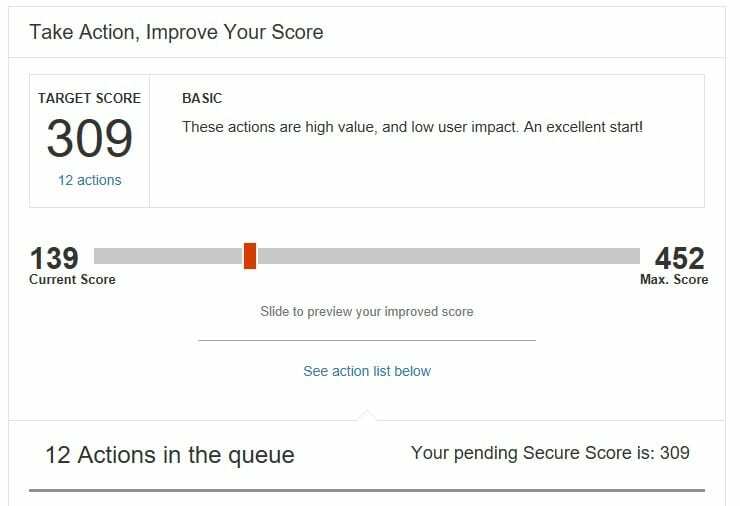 The Dashboard tab action item queue offers recommendations and their relative scores to improve tenant security and overall secure score. It includes explanations of the tasks being recommended for environment owner evaluation and determination. Score Analyzer tab offers a time-based line chart of comparison with your tenant score vs the Office 365 average score to provide historical reference to changes in score for your tenant. If any recommendations were implemented it also shows how those impacted the score. Keep in mind as the changes become more aggressive, so does the potential for increased end user visibility with those changes. For example, implementing Multi Factor Authentication or MFA, for all users would change their login experience by requiring them to use their phones for their authentication procedure.